(Nanowerk News) Imagine having skin so supple you could stretch it out to more than twice its normal length in any direction - repeatedly - yet it would always snap back completely wrinkle-free when you let go of it. You would certainly never need Botox. Lipomi and Michael Vosgueritchian, graduate student in chemical engineering, and Benjamin Tee, graduate student in electrical engineering, are the lead authors of a paper describing the sensor published online Oct. 23 by Nature Nanotechnology ("Skin-like pressure and strain sensors based on transparent elastic films of carbon nanotubes"). Bao is a coauthor of the paper. 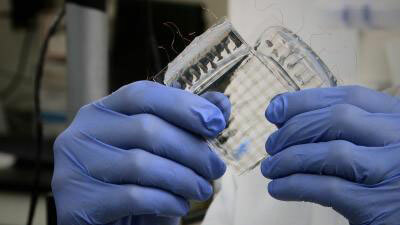 A close-up view of the super-stretchy, transparent, highly sensitive skin-like sensor that Zhenan Bao, associate professor of chemical engineering, and Darren Lipomi, postdoctoral researcher in chemical engineering, developed at Stanford University with their colleagues.